If you bill your customers rather than collecting payment right on the spot, then you’ll want accurate records of money that is owed to you. ZipBooks tracks accounts receivable so that you can keep on top of customer accounts, and see when they tend to take longer to pay. When you track your invoicing and payments with ZipBooks, the money you make and the amounts owed are automatically updated in your accounts receivable report. You see what a customer may have already paid on an invoice, amounts that are still outstanding, and how long it takes them to pay in general. For any transactions outside of ZipBooks, you have the option of adding them manually, so that the records you create are as accurate as they can be. 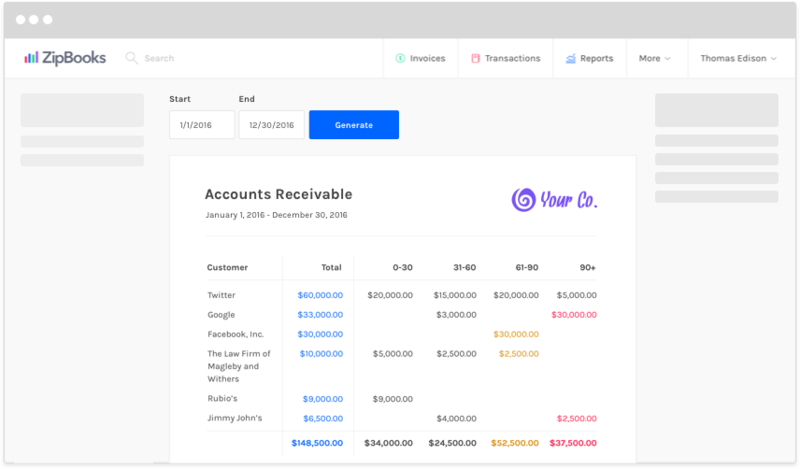 Zipbooks keeps track of your accounts receivable history and gives you smart feedback on which accounts are paying within a reasonable time frame, and which you should probably be a little more worried about.